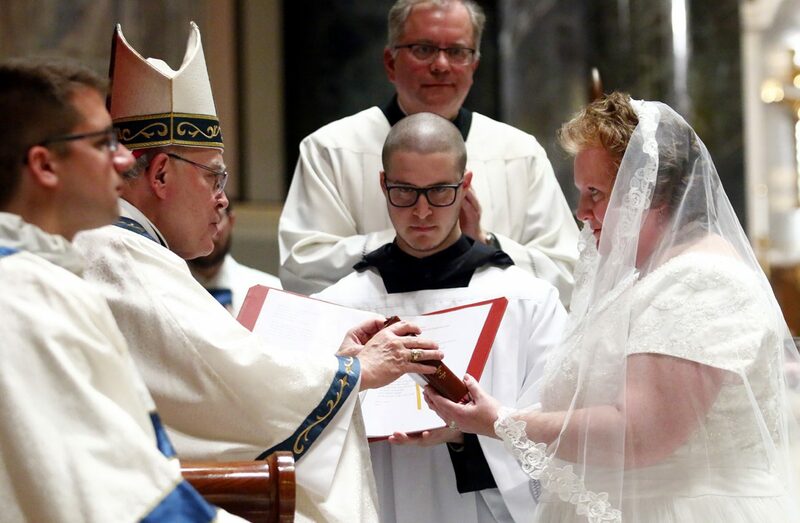 Archbishop Charles Chaput gives the Liturgy of the Hours, the daily prayer of the church, to Jennifer Settle during the liturgy at which she was consecrated to perpetual virginity. 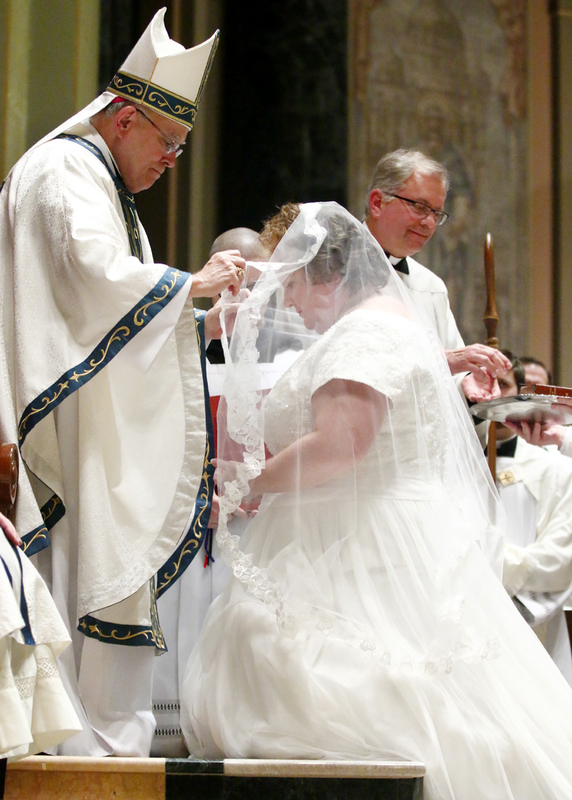 When Jennifer Lynn Settle was formally received into the Order of Consecrated Virgins at a solemn Mass celebrated by Archbishop Charles Chaput this year, she joined a very distinguished and ancient company. Agatha, Lucy, Agnes, Cecelia and Catherine of Alexandria who are all listed in the Communion of Saints as part of the litany recited at the Feb. 2 Mass at the Cathedral Basilica of SS. Peter and Paul, were consecrated virgins in fact if not in title long before the emergence of religious orders and congregations of women in the church. As a recognized state of life, consecrated perpetual virginity in the lay state was honored in the early church but fell into disuse until its restoration after Vatican II when the Council fathers sought to return to its Christian roots. Religious orders, which also require chastity going forward, do not insist on lifelong virginity and for example, a number of congregations were actually founded by widows and even at least in one case (the Holy Child Sisters) a divorced woman. Settle, 45, a member of SS. Simon and Jude Parish in West Chester and the managing director of Downingtown-based Theology of the Body Institute, is originally from Cedar Falls, Iowa. A Catholic by birth, it was while attending diocesan-conducted Loras College in Dubuque that she had a spiritual awakening and ever since her life work has been with the church in one form or another. Although she knew many good women religious, the life did not especially appeal to her and she assumed she would one day marry, without in the meantime compromising her moral standards. It was while she was receiving holy Communion during the first Mass of a priest friend. The words, “consecrated virgin” came into her head and she didn’t have a clue as to exactly what that meant. Afterwards she searched on the internet and there she discovered the National Association of Consecrated Virgins with a guide book that could be ordered. She felt called to the vocation, to be a witness to the world of consecrated life but not called to the religious life. 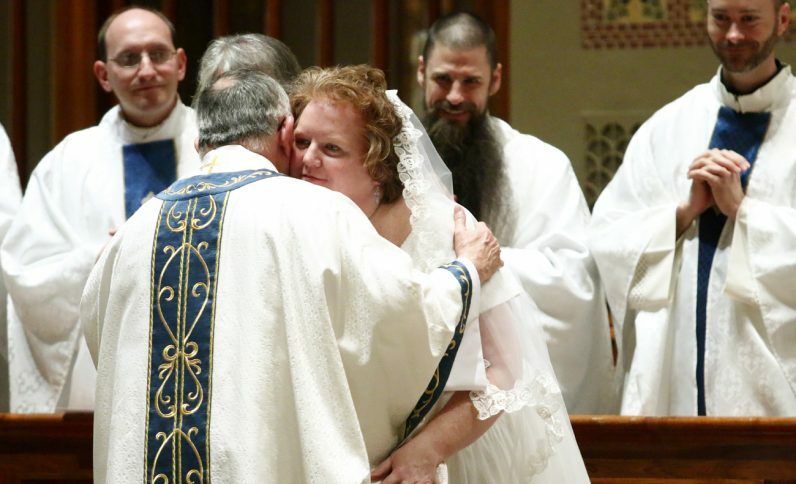 While the vocation as reinstituted is still relatively new, Settle estimates there are eight consecrated virgins in the Philadelphia Archdiocese, with about 300 in the country and 3,000 worldwide, a number that is expected to grow. Unlike the profession of vows taken by religious sisters, perpetual virginity is not a vow but a promise. It’s a promise that Settle regards as just as binding on her as a vow. And it is a solemn promise made before the archbishop to live out her life in perpetual virginity. After her formation under the guidance Father Dennis Gill, the rector of the cathedral and mentoring by Donna Huddle, who is also a consecrated virgin, the ceremony took place. At the Mass and ritual itself attended by friends and relatives from around the country, Settle, who was dressed in a symbolic white gown, carried a lit lantern as she approached the sanctuary, reminiscent of the wise virgins in Matthew 25:1-13. She lay prostrate on the floor for the gloriously sung Litany of the Saints. Archbishop Chaput gave a short, appropriate homily. Settle was invested in a veil, symbol of her state as a bride of Christ, and also a marital ring for the same reason. The archbishop then gave her a book of the Liturgy of the Hours, which he exhorted her to pray from daily. In the future, she will not wear the veil because as a consecrated virgin she does not wear distinctive garb. She will wear and treasure the ring. It is the same wedding ring that was given 65 years ago by her late father, Howard Settle, to her mother, Donna. Now her mother has passed it on to her. She will continue with her practice of daily Mass along with other devotions, and with the archbishop’s approval, her work with the Theology of the Body Institute. The institute itself is dedicated to the teaching of St. John Paul II for people married or single — creators of new families or celibate spouses of Christ, and yes, including consecrated virgins. God Bless You Jeni. You will be in mt prayers LOve Paul Would you be interested in The Flame of Love?